Hi Robin, found this episode very interesting – thank you. A question came to mind though, how did the Byzantine economy differ from the economy of 2nd century Rome (apart from size and scale of course)? Specifically, were the restraints on trade similar? That would require a lot more research! Perhaps a question you could ask again when we get to 1453? My guess would be that the attitude to merchants was similar but I don’t know if restrictions in the city of Rome were similar. What is the name of the intro and outro music you use? The link to Music Alley doesn’t work and google doesn’t give results either. Aside from that, great episode as always. The similarity between early Roman and Byzantine view on trade is interesting, as both found farmers and soldiers the most important professions. great episode as always, i have a question, as i am doing a research project on Byzantine identity i wanted to know where i would look use to find primary sources on the issue identity. 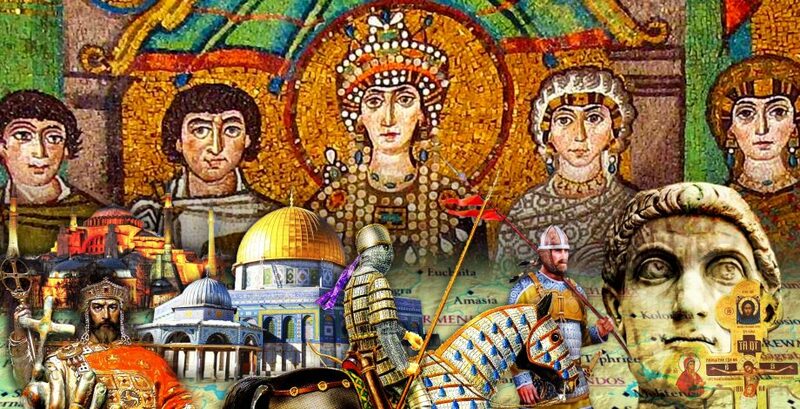 I know Hellenism in Byzantium is a good source to use, but more specifically primary sources that refer to the Byzantines as Greeks and vice versa where the Byzantines refer to themselves as Roman. If you can read Greek then no problem. But English translations may have interpolated the word Greek for Romans or vice versa. But you can find English translations of Procopius, Nicephorus and Theophanes pretty easily. You can probably find them in a library and just skim through to find examples. If you just want quotes from them then “Hellenism in Byzantium” has plenty. If you just google Byzantine Identity you will find other academic papers discussing the idea and quoting Byzantine authors. “The Byzantine Republic” has more too. How did the Byzantine attitudes towards trade/merchants compare the attitudes of the Republic or the Principate? And how did they compare to the attitude in Western Europe? I find interesting how little the atitude towards trade changed between the republic/principate and the medieval empire. Back then, the senatorial class was not supposed to engage in trade either.